Dessert in under five minutes! 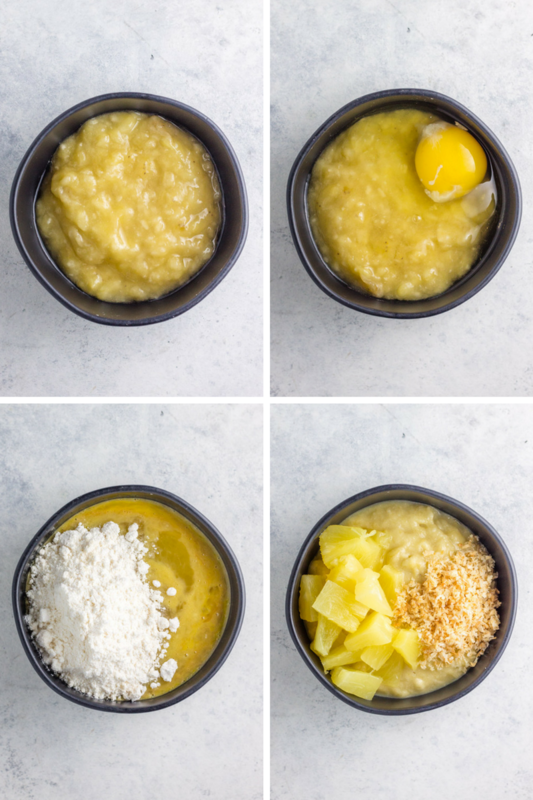 This paleo banana pineapple coconut mug cake is simple, quick, and packed with a variety of flavor – no sweeteners needed. When a decadent baked dessert is calling your name, try this healthy (and super quick) treat instead. Nap time = the best time. I love moments with my boys when we hit up the park on a sunny morning, or head to open gym at our local gymnastics organization, and playing trains for hours while breaking up toy wars between the two. But once 1pm hits and we’ve smashed lunch, potty, and possibly a change of clothes, it’s time for a mommy break! I’m not gonna lie, usually around this time I’m also feelin’ the need for a little post-lunch treat to congratulate myself for powering through half the day despite my 5 hours and 40 minutes of sleep the night before. Paleo banana pineapple coconut mug cake to the rescue. Just a few simple ingredients and a microwave makes MAGIC. And no sugar, honey, or maple syrup needed to sweeten! 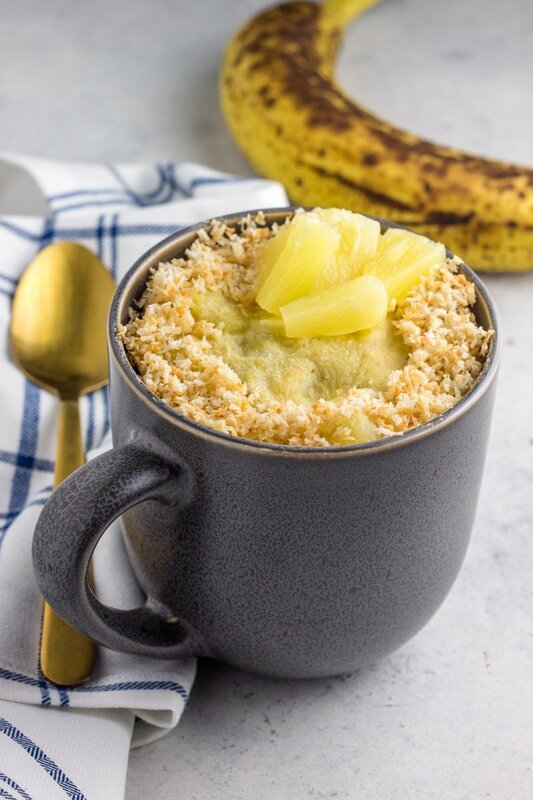 The natural sweetness of the banana, with the juicy pineapple, and decadent toasted coconut combines so beautifully and tastes amazing in this mini cake in a mug. It’s a healthy dessert my little ones love just as much as their momma, and a treat I don’t mind giving to them anytime they request. Not to mention it take just over 2 minutes to cook in the microwave and basically the same amount of time to prep. HELLO – it’s a cake recipe right up my ally! Toasting the coconut is optional, but oh MAN does pump up the flavor profile like 8 million times over. For me it’s a no brainer. Plus all that leftover toasted coconut is perfection when sprinkled over apples slices with almond butter. No coconut goes to waste here! And the riper the banana, the better! Don’t be afraid of those dark ugly ones. They’re the bessssst. The mug cake of all mugs cakes people. 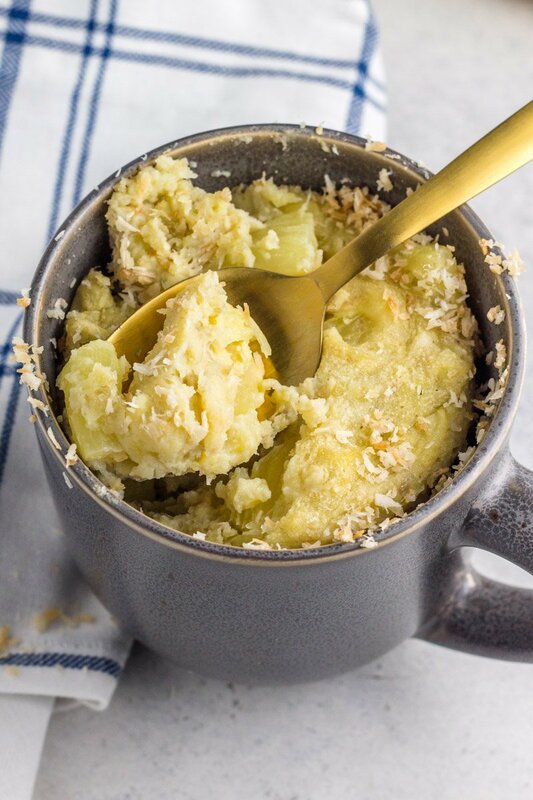 You MUST try this paleo banana pineapple coconut mug cake asap! Love quick, baked treats like this? Mug cakes your thing? Then be sure to also try this paleo strawberry mug cake and paleo pumpkin pie microwave soufflé. 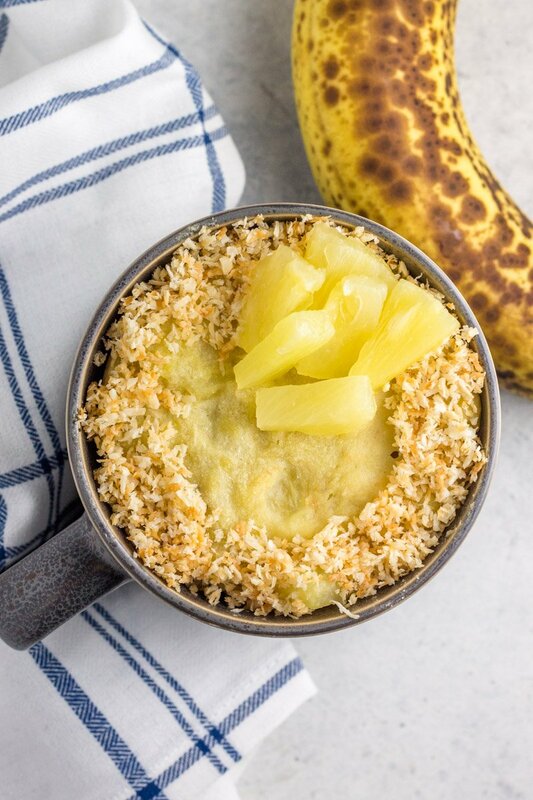 This paleo banana pineapple coconut mug cake is a healthy, naturally sweetened, grain free treat made in under 5 minutes! This looks amazing!! How would you cook it if you didn’t have a microwave though? I have a toaster oven but no microwave and would love to try this! I’m really not sure – I’d play a bit. Try 350 for 15-20 minutes and see! Hi, This looks delish! I can’t wait to make it. I only have fresh pineapple, which I can cut up into tidbits. My question is: should I drain off the juice? Thanks! Yes yes drain the juice! I’m certain you can make this in the oven, but I haven’t tried playing with the time or temp. Is this Whole 30 compliant? Unfortunately no baked goods of any kind that resemble a dessert are compliant. Enjoy!!! Hope you love it! I dig that idea! I even tried it with a few mini chocolate chips too. So good! Can I substitute anything for the tapioca flour? Oh this is going to be perfect!! I have a few ripe bananas and intended to make banana bread today but time got away from me. Now I’m sitting here post dinner really wanting banana bread! Quick Pinterest search and your recipe comes up top of the list. And I have all the ingredients! So grateful! Thank you Alanna! I hope you love it!